I passed into Vermont on my second day back on the trail. I typically don’t like stereotypes, and in all honesty, I do not remember Vermont being this way in 2016. MOST of Vermont has been mud, rather than trail this year! I’m not joking. There have been long stretches of mud and water puddles, and many places where rain-freshened springs have literally turned the trail into a creek! When the trail is like this, it slows the hike to a crawl. You can either walk through the mud where the footprints left behind are 3-6 inches deep, or you can tip toe through the soggy edges, or you can tiptoe across rocks and branches thrown down in the mud in an attempt to make a makeshift bridge to keep feet dry, but my feet have been soggy for four days in spite of my best attempts to keep them dry. There have been rocks and roots and climbs! The trail has been jungle like. Not my fave! There were two afternoons where it rained, and then carried over through the night, leaving a soggy, heavy tent. Thankfully, and amazingly, the mosquitoes have seemed to diminish! Mt. Greylock. It was the most beautiful thing I have seen on the trail for miles! 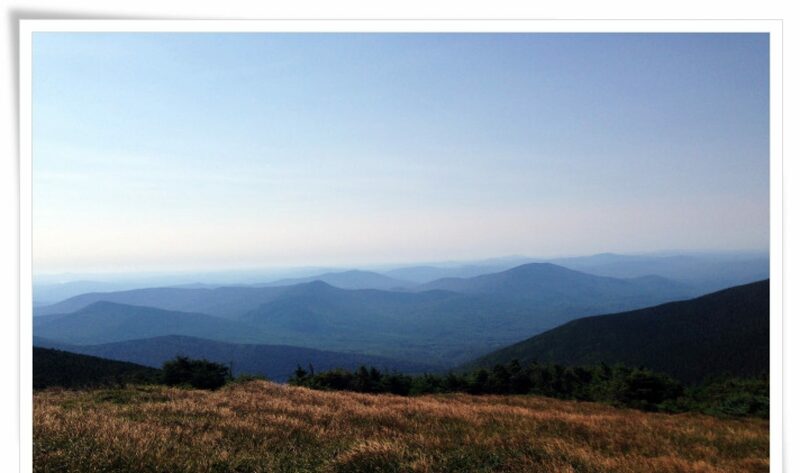 It’s the tallest peak in Massachusetts. The views were stunning and inspiring! The weather her was slightly cool and perfect. There is a lodge up there, which serves food, has rooms, and even a low cost bunkroom, but I didn’t stay nor eat. Later, I went over Mt. Williams (if I remember correctly) and met a lady who hopes to do a thru hike someday. She has lived in this area her whole life. I asked her to take my picture. Later, I passed into Vermont. The Vermont Long Trail coincides with the A.T. for a while, and many people come to hike it as well. After Vermont, only two more states to go! At this point, I have 538 miles left to hike before I reach the end of the trail. Another highlight for me was camping up on Prospect Mt. I had to pack in water for several miles, but it was worth it to be up there alone. The view was beautiful, and it was quite breezy. I had to dry my tent before I set it up, but I got there early enough to do so. The city below is Manchester Center, VT, which I would head to the next day. The hostel I was to stay at requires that you hitch a ride into town, resupply and eat, then call them to pick you up. I have successfully avoided hitching this hike. When I got to the parking lot, I didn’t have cell service and my Inreach battery was dead, so I couldn’t message Bud. I saw a few people drive into the parking lot, but I didn’t think they would drive me to town since they had just arrived to hike or whatever. I went up to the highway and stuck out my thumb. No one stopped. Talk about rejection! Then I heard someone down in the parking lot trying to get my attention. He asked me if I needed a ride into town. Yes, I did! Later, I was waiting at the McDonalds, where I was to be picked up to be taken to the hostel. I was sitting up against the wall, ‘with all me worldly goods aboot me’…when not one, but two young men mistook me for a bag lady! One asked me if I needed a dollar or any other kind of help, and the other asked me if I was hungry! 😂 I found the situation to be hilarious, but I thanked them both, and told them I was hiking and that I appreciated it and thought they were very sweet for offering. Then, I finally moved to a less trafficked part of the building and tried not to look quite so pathetic. I have really been struggling. I called the ER, and they explained that this illness could take a couple of weeks to resolve, and that strenuous exercise could cause it to take longer. My legs feel weak, and my leg muscles burn and ache. I feel really tired. Sometimes I think I feel like I might have a low grade fever , but I have no way of checking. I have been getting in my tent, and usually sleep about 10-11 hours each night. At this point, I’m getting 5-6 days of food in my mails drops and it makes my pack heavy, as the terrain is getting tougher! Not a good combo at this point in the hike, on top of everything else. I decided to take a Nero and a Zero in Manchester, which causes further worry about getting to the end on time…especially if I have to keep taking zeros. I really wanted a grand finale finish, but it’s looking more and more like I might have to flip. I saw Will and Tumble slackpacking, and then at McDonalds. We had breakfast together. That was nice. I hadn’t seen anyone I knew in this section. Stratton pond on a beautiful day! I feel like this post is disorganized, but I almost didn’t do a post this time. I’m just tired…and I miss Bud and home. I’m ready to finish this hike so I can go home! I got new shoes and these old ones I got in Duncan, PA have been retired! They even smell dead, or like something died in them! They now have a new resting place, along with one of my pairs from 2016! Btw-I finally posted on my wordpress account about my Smokies hike with pictures. Lol. Don’t be a stick in the mud, keep on moving through it. I went 5 1/2 days without a town stop. This next one will be 6! I only do blogs when I’m in town. If you do Facebook, you can search for Appalachian Sojourn and join my group. Bud puts updates there in between my blogs. 😊 I will check out your blog! Thank you for your prayers and encouragement! You do not look rough. I would venture the man who offered doesn’t make judgements and just wanted to offer a “kindness” in his eyes. Seems like he is a kinder person than some of the hilers you are meeting. You are doing incredibly well. According to the math, if you do 9.7 miles a day for 60 days, you will finish by October 10. You know you will do more miles than that and so you will have time to add some zeros. With you not crunching the miles out, and the time you have taken to recover, you kept up with Will and Tumbles. According to the new math they now teach, a 13 mile day while sick is actually more than a 20 mile day while healthy so thats why it felt like a 20 mile day. And keep in mind you can do some slack packing to compromise, giving yourself a partial rest and still doing some miles. It’s good you are getting 12 hours of sleep, I’m sure you need it. Dirty Dan and Chipmunk from Minnesota are hiking. Chipmunk came off the trail due to Lyme disease but Dirty Dan is still out there. They are/were Sobos. Your perseverance has kept you out there when a younger stronger man quit. Do not lose heart, you will gain strength as you heal. Awwww. 😊Thank you, Cheri. I did think it was incredibly sweet of those young men. Incidents like that restore my faith in humanity. It seems the media focuses so much on the bad. One thing I DO love about FB is that I often see videos circulated of random acts of kindness. One thing is for sure…I know I smelled like a bag lady. Thanks for working out that math for me. I’m trying not to worry but I’m leaving the option open to flip after the Whites if I need to. Remember you need that rest so don’t hesitate to take it. You are working hard plus your body is trying to heal. Listen to your body, love it and I feel everything will work out in the end. Thank you, Amy. I really appreciate your encouragement! I do think I needed it. I’m trying to focus on the journey this time, rather than the finish line, but sometimes I still get tunnel vision. Hang in there, chica! You are getting very close to the end of your hike. You can do it! You’re almost done! And you’ve persevered through so much. Funny… someone else I’m following also posted a photo of the tree with the jagged branch. 🙂 He just passed through there a day or so ago. I meant to say something about that. I read that the Native Americans use to break the branches to mark their way in the woods, and then they grow up with odd branches like this. I wondered if this could be one. Yes, I have read that too and it is quite possible. I see a lot of those while hiking through and around Shenandoah and places south of here.